Huvafen Fushi is in North Malé Atoll of the Maldives. Your Maldives experience begins with a breathtaking 30-minute speed boat ride from the airport. For those who prefer to fly you can take a 15 minute charter sea plane transfer across the atoll. Photo copyright Huvafen Fushi Maldives. Set within its very own lagoon, Huvafen Fushi is a naturalist's wonderland where the stunning environment above and below the waterline is an attraction in itself. All of the exquisitely designed rooms include private plunge pools. 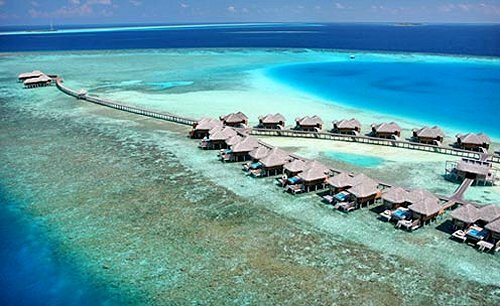 Huvafen Fushi invites you to choose from 44 naturally-modern bungalows - on land or over water. Or a very nautical experience with Sensuelle or the Dhonis.